Over the course of our 3+ years of travel we have taken a lot of photos. I mean a lot! We are currently traveling with over 4 terabytes of photos. We shoot most of our photos for our blog and Instagram in RAW which means the file size for each individual photo is over 30MB. This means we need a lot of storage. 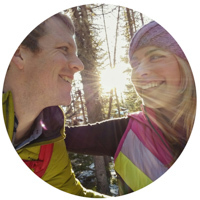 We have tried various methods of storing and backing up all of our photos and digital assets. We now prefer storing as little as possible on our laptops so all of our photos go on external hard drives. We need fast, reliable external hard drives to be able to do our jobs every day. If you’re planning an around-the-world trip you have probably already thought about upgrading your photography equipment so you can capture all the beautiful moments from your travels. But what you may have not considered is how your going to store those hundreds (or perhaps thousands) of photos you’ll be taking. Here are our favorite portable hard drives for storing all of your irreplaceable travel memories! Are you going to be shooting JPEGs or RAW photos? Are you selective when you press the shutter button or do you like to rapid fire and pick your favorites later? 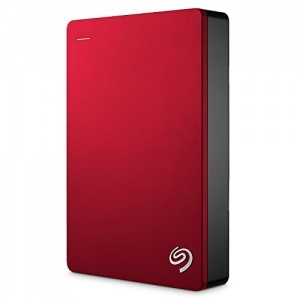 We have found that a 2 terabyte external drive is perfect for shorter trips. It will allow you ample storage without having to worry about deleting any images until you get home and can take some time to cull any unwanted photos from your library. If you’re going on a longer trip and expect to be shooting all of your images in RAW, you’ll likely want more storage capacity. The largest external hard drive option currently available in the “portable” category is Seagate’s 5 Terabyte Backup Plus. If you need more storage than that you should invest in 2 (or more) drives and split your photo library across them. 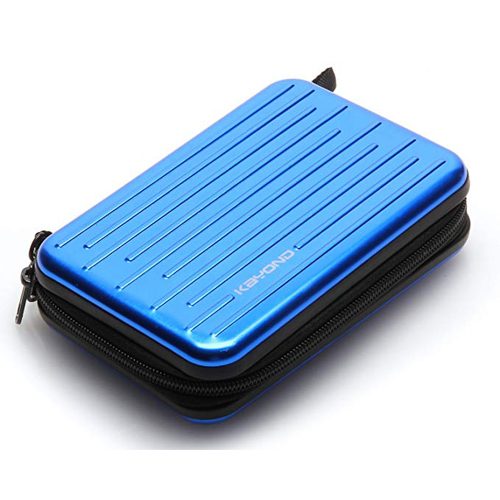 Since you’ll be carrying your hard drive in your luggage, you should choose one that is small and lightweight. Technology advances are being made rapidly in digital storage and you’ll be amazed by the capacity of an external drive that is not much bigger than a cell phone. All the external hard drives we recommend in this article are super compact and portable and you really can’t go wrong with any of them. If you go searching on your own just be sure to buy a “portable” drive rather than a “desktop” drive. Unless you’re planning on being especially rough on your hard drive, you shouldn’t worry too much about durability. All portable hard drives are built to withstand the general wear and tear of everyday travel and use. 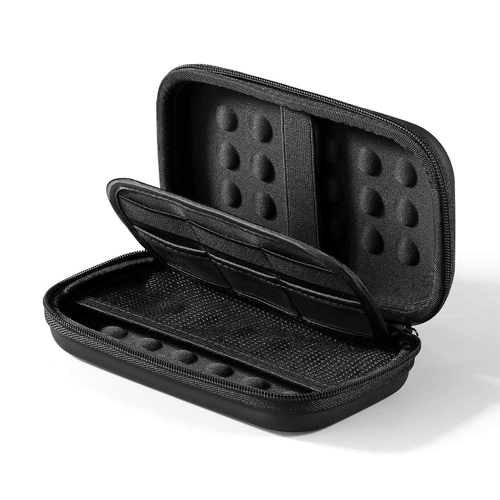 That being said, you’ll want to invest in a padded case to keep your hard drive protected. 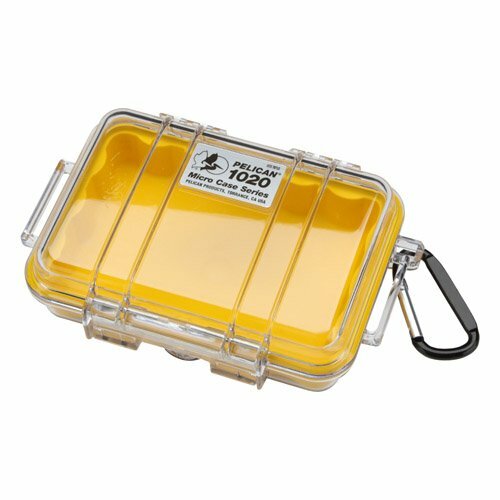 You’ll find a few of our favorite options for hard drive travel cases at the bottom of this article. 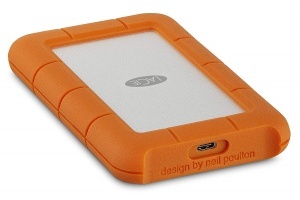 If you’re planning on putting your hard drive through more extreme conditions such as taking it trekking, using it while camping, or having it out in any type of wet conditions, you should invest in the LaCie Rugged External Drive (detailed below) which was built to withstand more abuse. When evaluating external hard drives the most important thing to consider is reliability. One of the worst things that can happen is to have your hard drive fail unexpectedly. In the best case scenario you can take it to a computer repair shop where they can hopefully recover your data. And in a worst case scenario you’ll lose everything you had stored on the drive. Either way it will likely put a serious damper on your vacation. Most hard drives come with a warranty and the manufacturer will replace the faulty drive. But that’s of little value when you have just lost all of your beautiful photos and travel memories. 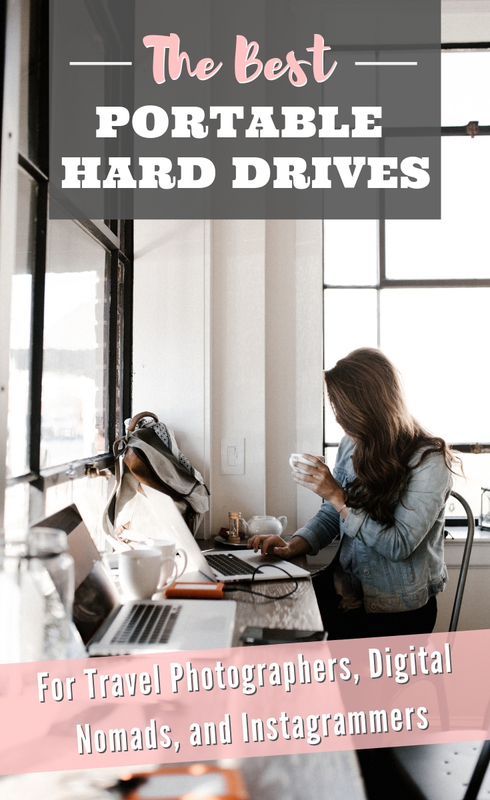 While it’s impossible to be 100% certain that your external drive won’t fail, you can minimize the risk by sticking to reliable brands like Seagate, Western Digital, Samsung, and LaCie. You should also keep an additional backup of your most important photos on a second external drive or online with a service like Dropbox or Google Drive. Seagate is our go-to brand when it comes to portable hard drives for photo storage. They are reliable, affordable, lightweight, and compact. Everything you could possibly want in an external hard drive! The Seagate Backup Plus Ultra Slim is less than a half inch thick and weighs less than 5 ounces. Squeezing 2 terabytes of storage into a hard drive this small is a marvel of modern engineering. It also offers a fast read/write speed of up to 120Mb per second. If your data storage needs are less than 2TB, look no further than this portable hard drive. Plus it comes in a couple of sleek finish options: platinum and gold. 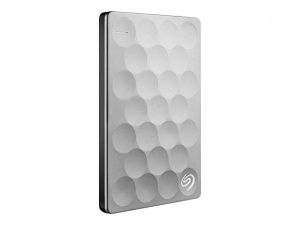 As much as we love the Seagate Ultra Slim drive, our storage needs have now outgrown it. Luckily the Seagate Backup Plus line of drives come in a variety of sizes ranging up to 5TB. They’re still super compact with the largest option measuring 4.5″ x 3″ x 0.8″ and weighing just over 8 ounces. Plus you can choose from multiple colors: black, blue, red or silver. 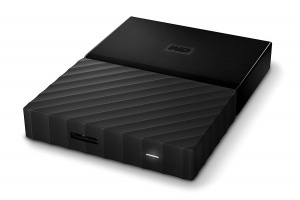 We currently carry 2 of these awesome external hard drives – one as our primary and a second for backup. We can personally attest to the quality of these drives as we have carried them all over the world and they have never let us down! Western Digital is one of the best names in data storage and for good reason. The WD My Passport line of external drives are not only reliable, but they offer an extra layer of protection for your peace of mind. You can choose to have you data encrypted and password protected while it is stored on your external hard drive. So in the unfortunate event your hard drive is stolen, no one but you can access your sensitive or personal information like photos of your passport, financial documents, or travel itineraries. My Passport drives are compact, lightweight and one of the most inexpensive portable hard drive options on the market. They also come in a rainbow of bright colors – yellow, orange, red, blue, and white. If you’re an adrenaline junky and plan on carrying your hard drive along on your outdoor adventures, you should opt for LaCie’s Rugged USB-C portable external hard drive. These durable drives can handle being dropped from a height of 4 feet as well as being run over by a car! They are also dust and water resistant. So whether you’re carrying them through the jungle, across mountain tops, or just to the beach, you can be confident that your data will be safe. Not only are these drives practically indestructible, they also utilize USB-C to offer faster transfer speeds of up to 130 MB per second. And if you’re traveling with a Mac laptop then check out their Rugged hard drive with built-in lightning cable to speed things up even more! If you don’t mind spending a little extra for your storage needs, the Samsung SSD T5 is the best external drive currently on the market. 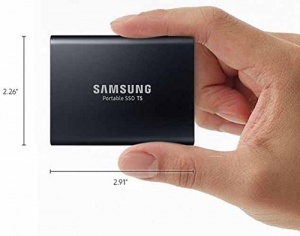 Samsung has made a major investment in solid state memory drives, and the SSD T5 is their top-of-the-line product. It uses solid state memory which makes it faster than the other portable drives we’ve reviewed here – with transfer speeds up to 540MB per second. Solid state memory also means there are no moving parts. Because of this and it’s metal housing, Samsung’s T5 drive can withstand a drop from up to 6.5 feet! It also offers data encryption and password protection so any personal data you store on the T5 will be safe in the event of theft. All of this comes in a shockingly tiny 2.3″ x 3″ x 0.4″ package and weighs in at just 1.6 ounces. That’s about the size of a stack of credit cards and the weight of a golf ball! Tiny, lightweight, dependable, and fast, this drive blows away the competition but it comes with a high price tag. The Samsung T5 runs 2-3 times what a comparable amount of storage would cost you in a conventional (non-solid state) hard disk drive. Your hard drive is going to be full of irreplaceable data (your amazing vacation photos) so you’ll want to make sure it doesn’t get damaged. 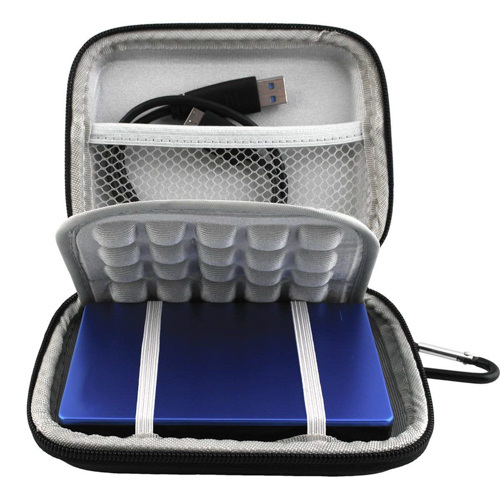 Be sure to invest in a carrying case to protect your portable hard drive. Here are a few of our favorite options for protective carrying cases. Do you have a favorite hard drive or photo storage method we have missed? Tell us about it in the comments below!